Paul Hollywood really does know how to make bread. Look here. PEOPLE look at me and assume I'm a good cook. I suppose they equate my air of well-fed contentment with time spent in the kitchen rustling up a boeuf bourguignon with rustic bread followed by apple charlotte and clotted cream. They'd be wrong. I usually rush home in the evening, flinging open cupboards to see what I can throw together to make something vaguely edible, wondering if I can defrost a lamb chop or two before the starving better half gets home for his tea. I try not to get all my food in supermarkets and manage to visit a proper market now and again. I'm always drawn to those specialist stalls piled high with wonderful things like olives stuffed with garlic. Then there are those that advertise "artisan" products. To me, artisan means it's not mass produced and therefore costs an arm and a leg. Which is why, after spotting a delicious looking artisan walnut loaf that cost £3 – yes THREE WHOLE POUNDS – I thought I might buy a breadmaker. I had visions of waking in the morning to the smell of freshly baked bread, just begging to be smothered in butter and jam. I could make my own walnut bread – or a nice sourdough or a focaccia loaf – for a fraction of the price. Bread so delicious that Paul Hollywood would ask me to be a guest on his show. As with so many of my plans to turn myself into a domestic goddess, this idea was destined to go awry. I mentioned the word breadmaker to her and she said she'd got one she never used any more. She scrabbled around in the back of her cupboard before emerging with a scruffy looking machine that looked like a huge white concrete block. "Does it work?" I asked dubiously. "It did the last time I used it," she replied, wiping it down with a damp cloth. She neglected to tell me that this machine had been made at the dawn of bread-making technology. I half expected to have to light a small fire in its base by rubbing two sticks together. And it had no instructions or recipes. I should have stopped right there but I thought I'd give it a go and went on the internet to try to find the necessary information. I thought I'd sussed it out and as soon as I'd got all the ingredients together I started to make a basic white loaf. I switched on and everything seemed to be going swimmingly. It kneaded and rested; kneaded and rested. I peeked through the little window at the top and everything looked very… well, very doughy. So I left it to work its magic. Then as it switched to bake mode – click – all the electricity went in the house. I reset the trip, hoping it was a coincidence, and switched the breadmaker back on. The electricity fused again. Not wanting to tempt providence any further, I removed the dough from the breadmaker. It looked a bit "bready" so I thought I'd cook it in the oven. Not a great success. I left it cooling on the side and went out. When I got home the better half was smiling brightly – an unusual and slightly worrying occurrence. I glanced down to find he was using my beautifully crafted loaf as a doorstop. Oh very funny. Very blooming funny. I've given up breadmaking for now. I might start making it myself, especially after hearing Paul Hollywood say that kneading dough gets rid of bingo wings. If that doesn't work, then £3 a loaf for an artisan loaf is beginning to sound quite cheap. 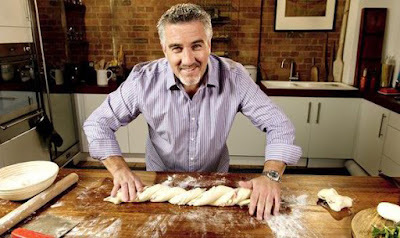 If you want to know how to make bread properly, read Paul Hollywood's Bread (UK), Paul Hollywood's Bread (USA). Wow, that was a bit dramatic losing lights and all. Think that bread maker needs to retire. It's been consigned to the trash, Patti!